Ashley Robinson (blue) shoots at goal during Peterborough Sports' 1-0 defeat at home to Market Drayton last weekend. Photo: James Richardson. It doesn’t get any easier for struggling Peterborough Sports. The city side dropped into the bottom four of Division One South of the Evo Stik League following a 1-0 defeat at home to Market Drayton last weekend (October 28). And tomorrow (November 4) they host unbeaten leaders Basford at PSL. The visitors beat Sports 3-0 in the first round of the FA Trophy earlier this season and have won 10 of their 13 Division One South matches. Peterborough Northern Star forwards James Hill-Seekings (left) and Zak Munton celebrate Tuesday's win over Sleaford. Photo: Chantell McDonald. @cmcdphotos. Spalding and Stamford AFC are both at home tomorrow against Carlton and Sheffield respectively. Stamford are protecting an unbeaten home record. Meanwhile Holbeach United manager Seb Hayes has played down United Counties Premier League title talk despite his side’s current run of 12 wins in 13 competitive matches. The Tigers will have a better idea of their prospects when they travel to leaders Leicester Nirvana on Saturday before hosting fellow challengers Eynesbury next Wednesday (November 8). Deeping Rangers and Wisbech are also in touch at the top. Deeping are at Harborough, while Wisbech, who are unbeaten in 11 matches since Gary Setchell became manager, have a tricky home game against Desborough. Peterborough Northern Star should make it back-to-back wins as they host struggling St Andrews at the Branch Bros Stadium. Division One South: Peterborough Sports v Basford United, Spalding Utd v Carlton Town, Stamford v Sheffield FC. 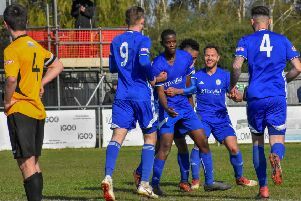 Premier Division: Harborough Town v Deeping Rangers, Leicester Nirvana v Holbeach United, Newport Pagnell Town v Yaxley, Peterborough Northern Star v St Andrews, Wisbech Town v Desborough Town. Division One: Buckingham Town v Bourne Town, Melton Town v Huntingdon Town, Oakham United v Blackstones. Division One: March Town United v Cornard United.